With the news that fuboTV has significantly expanded its product offering to move from soccer-centric channels to those plus a long list of entertainment and news channels, fuboTV’s legal streaming service is now in the same ballpark as Sling TV and PlayStation Vue. We already know that fuboTV offers the most comprehensive selection of soccer coverage on any legal streaming platform in the United States, but how does it compare to Sling TV and PS Vue on everything else? We take a closer look in our comparison guide below. 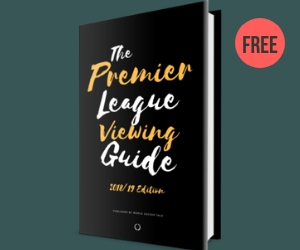 As you can see from the streaming options below, each one has its own pluses and minuses — so what may be a perfect one for you may not interest others depending on which leagues or programs you want to watch. 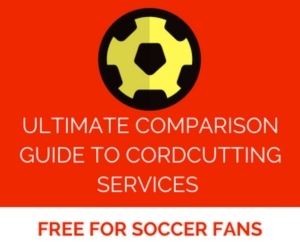 Also note that the comparison guide below doesn’t list non-soccer-related channels. Each of them has a long list of news, entertainment and children’s networks available. But for the purposes of this comparison guide, we’re focusing on soccer only. Nice comparison. Do you know where there is a comparison of non-soccer related channels for these streaming services all in one place? Would be of interest to others in the household to help decide which service to get for the entire family. Hi Casey, I’m not aware of one but I can certainly put one together to help people make a decision. Stay tuned. Please do. I have Sling but FUBO is beginning to give them a run. I also watch Cricket on Willow which is only $5 monthly on Sling. That would be a deal breaker if its not available on FUBO. Cord cutters news keeps one but I don’t believe they have updated to include Fubo. Chris, does Fubo intend to honor legacy packages? I have their legacy 10 dollar Latino package to supplement my Vue subscription. The pricing for Vue depends on whether they provide all the major networks in your area. Sling Latino is 10 bucks a month as a standalone service and includes all Univision channels, Both English and Spanish versions of Being and Azteca. Anybody with Vue can access Fox Soccer Plus through the Fox2go app even if you don’t subscribe to it as an add on channel. fuboTV said they would honor previous pricing if customers stick with the same plan. For FOX Soccer Plus via Vue, is that authenticated access to FOX Sports GO or FOX Soccer 2GO or both? I log into Fox Sports Go with my Vue credentials (I subscribe to their Core package, I don’t have the Fox Soccer Plus add on channel or have Fox Soccer 2Go). It lists FS1, FS2, myregional Fox networks, their college networks and Fox Soccer Plus (all the way over to the right). I didn’t notice it until a couple months ago when someone on Reddit pointed it out. Does the fox sports go give you access to sporting events on your local FOX channel. Vue does not offer FOX in my area just FOX ondemand which means no CBB, CFB, NFL, MLB, or Bundesliga games on it. I do but the caveat is that my local Fox and CBS networks are available through Vue so not sure if that makes a difference. I also usually watch the local networks through my antenna. I would give all of these free trials a try and see which works best for your interests. I do have access to games on my local FOX through Fox Sports Go app on PC. I think you need to add that at least with FuboTV, you only get access to the Fox and CSN regional networks only if that network serves your area. (I am not sure if that applies to Playstation Vue). Please correct if this is wrong. You’re correct. On sign up, it asks for your zip code and then serves up the FOX Sports Net regional channel as well as local CSN channel (if available) as well as the local FOX and NBC over-the-air networks (if they’re available in your local city). It won’t provide access to all of the FOX Sports Net or CSN channels available nationwide. Only your local one(s). PSVue only offers a 7 day free trial, not 30. Ok thanks. They used to do the 30-day trial, but I’ll update the chart accordingly. For me its seems like PS Vue would be the best. One question the cloud DVR is that actual shows getting recorded or is it just DVR features like rewind, fast forward, and pause? If it is an actual DVR how many recordings can you keep and how many can be recorded at a time? The DVR function on Vue can be a little funky but overall works very well. You can set up to 5 profiles in Vue so each profile has their own set of recordings. So if my wife logs into her profile she sees just the shows she recorded and not all the matches and games I’ve recorded. It’s pretty much unlimited recording though somebody on Reddit posted that once you get to 500 “shows” in a profile, it will tell you there are no more slots. To access your recordings, you go to the “My Shows” row and they are listed there. It keeps recordings for 28 days, after which they drop. How it determines a show is inconsistent, Apparently it depends on how the networks provide the data to Sony. When I tag a Premier League match on NBCSN, it considers that one single show and will record all of the matches. You click on ‘Premier League Soccer” and you will see all the matches that have been played in the last 28 days. However, when I tag a La Liga match, it only records that singular match. I have to tag each match to record those Bein and Fox. If I tag an NBA game, it considers that one show but literally records every NBA game across every channel. So you have to learn the nuances of each sport/channel. You cannot set the DVR to start recording early or to keep recording past the scheduled end time. It never impacts a soccer match but you have to be creative if you are recording other sports, which often run past their time slot. Hope that helps. I believe in the package comparison at the end of this great article. sling tvs package that includes those channels would be $25 a month. To get beIN SPORTS, Univision Deportes plus the FOX Sports channels plus the NBC channels, the Sling TV price is $45 per month. ($40 for Sling Orange+Blue plus $5 extra for beIN SPORTS and Univision Deportes via the Best of Spanish TV add-on package). I get the full spectrum of TV stations over TimeWarner / Spectrum cable, but my issue is how compressed some of the video is on different channels. For example FS1 games don’t look like they’re played on grass, more of a green-gooish mud. Are any of these OTT streams actually 1080P (believe all my sports channels are 1080i)? Do they have lighter compression than TW? I know there’s like 20 different variables here… but for me, FS1 is always bad whether I’m watching AT&T, TW, Spectrum, etc. Gaffer, how do these feeds look to your eye? For me personally, the feed of beIN SPORTS on Sling TV and fuboTV is better via those streaming services than my TV signal (Comcast xfinity). As for FS1, it fluctuates. Your best bet is to try the different services with their free trials and see which one works the best for you. The quality is great, but it’ll depend on your broadband speed, so the quality can vary. I love the concept of FuboTV, and I was an early subscriber. I left due to persistent problems with streaming and DVR feeds. After roughly a year away, I went back recently and was pleased to see some extra channels offered in the Latino-oriented package (especially Fox Deportes). However, while the streaming/DVR feeds seemed a bit more reliable than before, I promptly left again because too much of the available content (i.e., everything from both GolTV and Fox Deportes) cannot be recorded for later viewing with the DVR function. That issue, plus the fact that my AT&T U-Verse cable is just far more reliable and offers far more recording capability, was the deal-breaker for me with FuboTV. It’s a great idea on paper, but they just don’t really execute it very well. DVR functionality is slowly being rolled out to the new channels. Looks like they added NBCSN DVR functionality is available starting today, for example. I’m sure the plan is to offer DVR for the other channels too in the near future. It also appears they’ve added all of the FOX channels to DVR today too. It looks like FuboTV has added that DVR function to most of the channels now, but it’s implementation is still buggy. I’d like to see that fixed next along with adding an additional slot or two. I still think it is one of the better deals out there if your main interest is to watch international soccer for now. That may change once UCL moves to Turner Sports for 2018/2019. Wonder if Turner is also looking at Serie A and La Liga. If I remember correctly, Serie A rights are up after this season, and a five year deal for La Liga with BeIn started in 2015/2016 (so I guess that would not be up until 2019/2020). Still, fubo does have one Turner channel… NBA network, so I am sure they and other services will just go with the flow and try to make deals if there are major changes to streaming rights over the next 2-3 years. I stand corrected. The Serie A rights are through 2017/2o18, For some reason, I thought the La Liga contract with BeIn was a five deal starting with 2015/2016 but I could not find a source. Would not be surprised if Turner Sports takes a very close look at one or both. A game like Napoli vs Juventus should really be on TV. beIN SPORTS’ contract to show La Liga finishes at the end of the 2019/20 season. PlayStation Vue announced today that their $35/month core slim package ends immediately for new subscribers and times-out after three billing cycles for current subscribers. Next cheapest option is $40/month. I recently cut the cord and I am trying to figure out what is the best way to go. Sling or fubo. My question is; can you go back and view a game if you miss it? Or I have to have the dvr option available? I heard sling has this option, but how far can you go back? But if you switch on Sling when you come home after a game has ended, you’re not able to access it via Sling on-demand. If you didn’t DVR it, you’d have to wait until there is a replay. However, with fuboTV, they have an on-demand feature called “Look Back” where you can watch most of the programs/matches from the previous 3 days, so even if you forgot to DVR it, you can still access it. Also fubo Premier has a DVR that’s included with it that allows you to record up to 10 programs at a time and keep the recordings for 10 days. Sling TV has DVR functionality but you have to pay $5 per month extra for it. I just jumped to Fubo from Fox Soccer 2 Go (now Fox sports pass I believe) this past season. I mostly watch Bundes, EPL, CL, Europa, and international (plus the occasional one off from la liga, serie a, or french ball). Definitely the selection of matches is better on Fubo. Resolution and overall video quality are certainly better, though that depends on the source for the match (beIN being quite good). But nothing is quite as frustrating as DVR’ing something and going back to find it fails to load or just doesn’t exist. Additionally, I’ve had pretty jumpy playback, albeit intermittently. It’s not a killer, but it doesn’t help sell the quality of fubo. The disappearing match factor is a killer though and has me considering different options. Once upon a time Fox had EPL rights. Man, that was a couple of great seasons. I watched nearly every match of every team for 2-3 years. The fidelity of those streams wasn’t all that great, but it was good enough. Them golden days are no mas. Now it’s a bit more of grabbing this match from Reddit, another from fubo, etc. To put into simple terms, I’d rather have a 1992 Ford Fiesta that runs than a Ferrari Spyder that never leaves the shop. Ok, that’s a bit of an exaggeration in comparison. Right now they all feel like a 2007 Honda Civic, just with different options. Not sure if I should chalk the frustration up to being in the States, the craziness of securing tele rights across European borders, or technology being slow to evolve into something truly great for football fans. I do, however, fantasize of moving to some obscure country jammed in between European football giants (re: Luxemburg?) and having endless channels of hi-def matches to flip through in my days off. Grass is greener I guess. Until then, I’ll just yell at my tv for 15′ at a time until I resort to crappy highlights on YouTube. Here’s to hoping Sling is the reliable solution. Thanks for the article! Out of all of the streaming services I’ve tried, Sling TV is the one with the most reliable stream. Sling TV isn’t perfect (it doesn’t have the selection that fuboTV has, for example) but it’s consistently reliable. Which one would you recommend to watch Serie A? For Serie A, the recommendation would be fuboTV because many of the Serie A games are on beIN SPORTS Connect, which is completely integrated into the fuboTV platform. What direction do I take to get sports and network exclusively through a samsung smart tv with TOS.2015. I have internet, but no computer. Bummed in Arizona. You have Direct TV Now listed as $60. Is Bein even available on Direct TV now? beIN SPORTS is not available via DIRECTV NOW. Also, you have Fubo listed as $19.99 but I’m only seeing it available for $39.99. fuboTV is available for $19.99 for the first two months, and then $39.99 each subsequent month. Has anybody tried YouTube TV? It seems to have most of the bases covered; NBCSN, CNBC, USA, NBC, FS1, FS2, ESPN1, ESPN2 and unlimited cloud DVR for $35. And a free month at sign up. Limited platform support is stopping me from trying it out. I tested it out a few months ago and talked about it on the World Soccer Talk Podcast. For me, YouTube TV not having beIN SPORTS or beIN SPORTS en Espanol is a big loss. But the biggest reason why I didn’t like it was that it isn’t available on Roku, so to watch it on TV, I had to use Google Chromecast. YouTube TV has potential but isn’t the finished article at this time in my opinion. i also love la liga but i have a free app to watch those games so im not worried about la liga. The UEFA Champions League will be with Bleacher Report Live next season and not FOX any longer, so FOX Soccer Match Pass would not be recommended since they won’t have the rights. With Bleacher Report Live (aka B/R Live), it’ll be a new paid subscription service but no details have been announced regarding pricing yet. Your best bet would be to sign up for a streaming service through the World Cup (fubo, Sling TV or DIRECTV NOW, among others) and then make a decision in July what you’ll do for the Champions League next season. Univision Deportes will broadcast the Champions League in Spanish, but depending on which service you want, you may want to wait until Bleacher Report announces their pricing before making a decision (as well as finding out if Bleacher Report Live will be available via any other streaming service). I am based out of Seattle market and have a subscription of sling blue. Is it sufficient to watch all the matches for the world cup? As per slingtv WC schedule “https://whatson.sling.com/sports/#184”, all matches are covered under FS1 and FOX. Fox Markets include WNYW New York, WTXF Philadelphia, WJBK Detroit, WTTG Washington DC, WJZY Charlotte, WAGA Atlanta, WOFL Orlando/Daytona Beach/ Melbourne, WTVT Tampa/Saint Petersburg, WOGX Gainesville, WFLD Chicago, KMSP Minneapolis/Saint Paul, KRIV Houston, KDFW Dallas/ Fort Worth, KTBC Austin, KSAZ Phoenix, KTTV Los Angeles, KTVU San Francisco/Oakland/San Jose. fuboTV is also showing FS1 and FOX, but is the FOX on fuboTV also for above selected markets only? What is the best option for me being in Seattle? fuboTV has access to your local FOX in Seattle (both live and on-demand). Plus it includes a DVR if you want to record any matches. Dear Chris, you should add this soccer coverage guide to the Streaming tab of the top bar.